Place potatoes in large saucepan and add water to cover by 1 inch. Bring to boil over medium-high heat; add 1 tablespoon salt, reduce heat to medium, and simmer, stirring once or twice, until potatoes are tender. 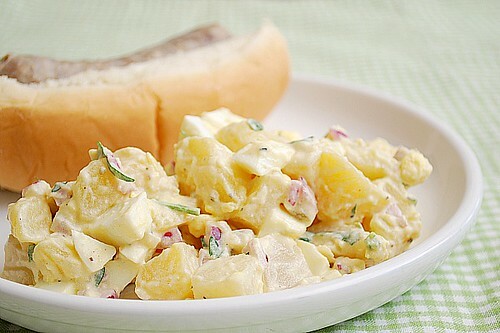 Joelen, this potato salad looks amazing! Can you believe that I have never eaten potato salad before? Cold potatoes just seem unappetizing to me. This looks delicious. I was wondering if I can substitute the red wine vinegar to something else as I don't consume any alcohol. Would white vinegar or apple cider vinegar be okay? Anonymous - you can certainly use white or apple cider vinegar in place of the red wine vinegar.